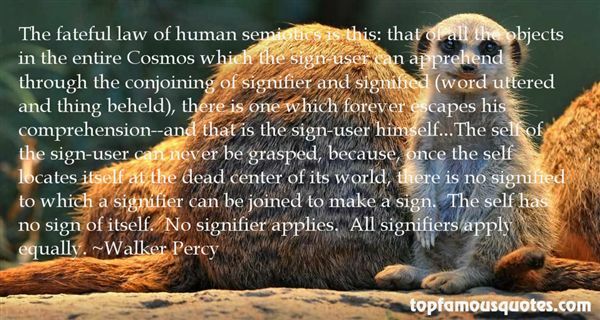 Reading and share top 8 famous quotes and sayings about Semiotic by famous authors and people. 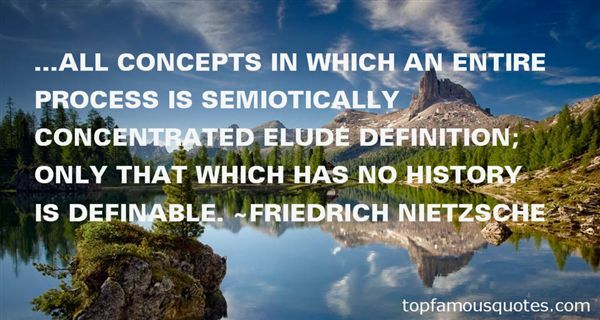 Browse top 8 famous quotes and sayings about Semiotic by most favorite authors. 1. "...all concepts in which an entire process is semiotically concentrated elude definition; only that which has no history is definable." 2. "Reading a novel after reading semiotic theory was like jogging empty-handed after jogging with hand weights. What exquisite guilt she felt, wickedly enjoying narrative! Madeleine felt safe with a nineteenth century novel. There were going to be people in it. Something was going to happen to them in a place resembling the world. Then too there were lots of weddings in Wharton and Austen. There were all kinds of irresistible gloomy men." 3. "Semiotic was the form Zipperstein`s midlife crisis had taken... Instead of buying sports car, he'd bought deconstrution." 4. "Ectoplasm is shapeless, it is "informe," a kind of primordial paste—and to show itself as this, it annexes semiotic markers that designate intermediate spirit worlds. When looking at these fluid, inchoate forms, sometimes imprinted with a face, it is worth recalling that the word larva, used in English for the early stage of a caterpillar, meant "ghost" or "specter" in Latin, but is also used by Horace to designate a mask, such as might frighten an observer, while the verb larvo meant "to bewitch" or "enchant." 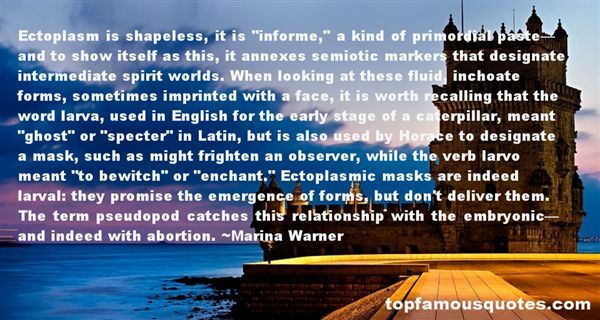 Ectoplasmic masks are indeed larval: they promise the emergence of forms, but don't deliver them. The term pseudopod catches this relationship with the embryonic—and indeed with abortion." 5. "Semiotics is in principle the discipline studying everything which can be used in order to lie. If something cannot be used to tell a lie, conversely it cannot be used to tell the truth: it cannot in fact be used "to tell" at all." 6. "The fateful law of human semiotics is this: that of all the objects in the entire Cosmos which the sign-user can apprehend through the conjoining of signifier and signified (word uttered and thing beheld), there is one which forever escapes his comprehension--and that is the sign-user himself...The self of the sign-user can never be grasped, because, once the self locates itself at the dead center of its world, there is no signified to which a signifier can be joined to make a sign. The self has no sign of itself. No signifier applies. All signifiers apply equally." 7. "All arguments between the traditional scientific view of man as organism, a locus of needs and drives, and a Christian view of man as a spiritual being not only unresolvable at the present level of discourse but are also profoundly boring...From the scientific view at least, a new model of man is needed, something other than man conceived as a locus of bio-psycho-sociological needs and drives.Such an anthropological model might be provided by semiotics, that is, the study of man as the sign-using creature and, specifically, the study of the self and consciousness as derivatives of the sign-function." 8. "This is the perennial danger which besets semiotics: what with man being preeminently the sign-using creature, and what with man using signs in everything that he does, semiotics runs the risk of being about everything and hence about nothing." You, dear reader, have now two accounts to choose between and there can be no doubt which is most probable."